Donald Trump and the Republican Party are in denial, but a big part of their cover story has been blown away with the indictment of three companies and 13 Russian citizens for undue foreign meddling in the 2016 elections and related crimes. We should expect those who have repackaged libel and presented it as “alternative facts” to continue their ugly divorce with reality. The indictment, which will surely not be the special prosecutor’s last — even if Mr. Mueller is fired and someone replaces him in that office — did not name any American accomplices. The full extent and nature of the relationship between the Trump campaign and Russian agents remains unknown. 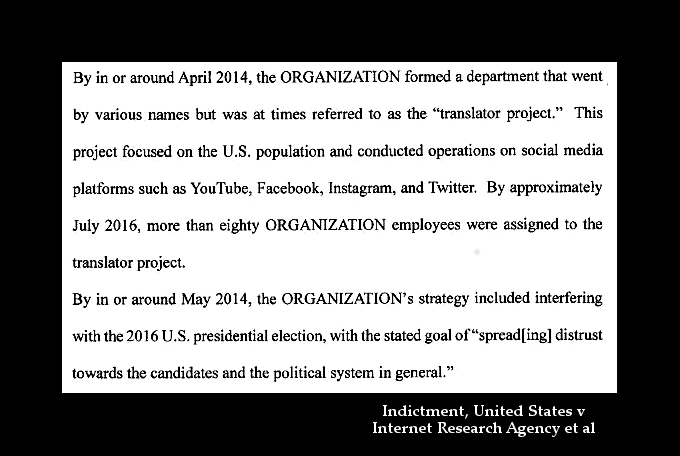 The indictment describes a much farther reaching Russian destabilization effort, however, one that is ongoing to this day. It describes online agents’ generalized campaign of defamation, disinformation and manipulation of US public discourse. It describes Russian agents coming into the United States to participate in American electoral politics, in violation of foreign agent registration, campaign finance disclosure and US immigration laws. It describes campaign ad purchases through such giant US companies as Google and Facebook, in violation of US election laws because these were foreign entities doing the purchasing. It describes various forms of identity theft, from the blatantly illegal hijacking of real persons’ Facebook accounts to boost their fake organizations, to the legal gray zone of posing as supporters of Trump, Bernie Sanders or other candidates or of social movements of the left or right. Americans — the government, the political parties, social movements, media and individuals — need to strengthen the defenses against this sort of thing, and not only when it’s practiced by foreigners. Americans should not get away with such sordid games within the US body politic either, and the United States should not behave this way abroad. There are two big dangers here. One is a ruinous over-reaction that leads the United States to spend trillions of dollars that it really doesn’t have for an escalated series of conflicts with Russia. The other is that, in the name of security, authoritarian individuals or institutions will shut down debate so as to enhance their own power. Those who have been disloyal, dishonest or just plain gullible ought to be identified as such and penalized appropriately. In most cases the proper remedy is just pubic disrepute. There should be consequences for libel. Assumed names should be traceable back to their real world originators. We don’t actually know, and may never know, if foreign manipulation swung the close 2016 US presidential election. We ought to know that this manipulation played upon weaknesses in the US political system and the personal flaws of prominent actors within it. Americans caused these weaknesses, not foreigners. Americans must solve the problem. All who served the Revolution have plowed the sea.